i. 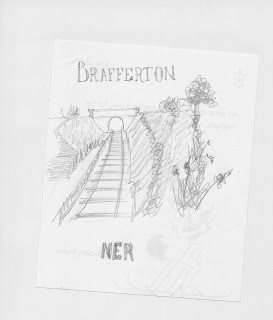 Here is the basic plan for "Brafferton". The yard lines aren't sketched in yet, but I've incorporated that into the subsequent 3D model. Ultimately the layout will be circular, but to meet the Challenge Rules I've restricted the staging to keep the overall area within 9.42 sqft. ii. I spent a day or so making a 1/8th scale 3D model to get a better understanding of how the layout might look. The "baseboards" actually represent how the real ones will be constructed. iii. When modelling, I often do little doodles as below. These aren't necessarily accurate or used in the actual model making. However I use them as inspiration and to get ideas bouncing around. I knew there'd be a reason....! This looks good for the next NEAG Mini Meet. Now when will that be...........? Looks a really interesting idea, Tony, and quite possible to complete by 2010. 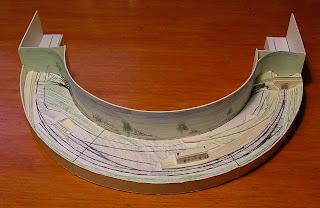 You might consider a hidden loop round the inside of the layout - that way you can use it for testing locos, or as a headshunt for the fiddle yard when you build the rest of the circle. I saw a layout once where the whole of the outside was scenic and the fiddle yard was around the inside of the layout. 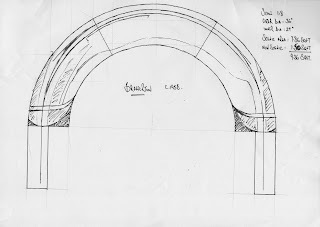 Your layout is probably just too tight a radius for that, though.